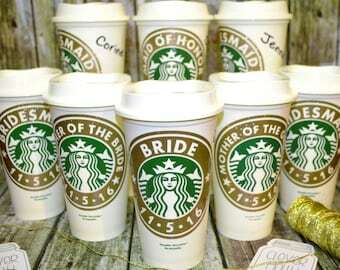 Wedding Party Gifts or Bridesmaid Gift Idea... Personalized Starbucks Coffee Cup • Tea Cup, *Genuine Starbucks® Reusable Cup that I personalize with a name (and optional monogram) and then place each in a cello bag wrapped with a matching cord. 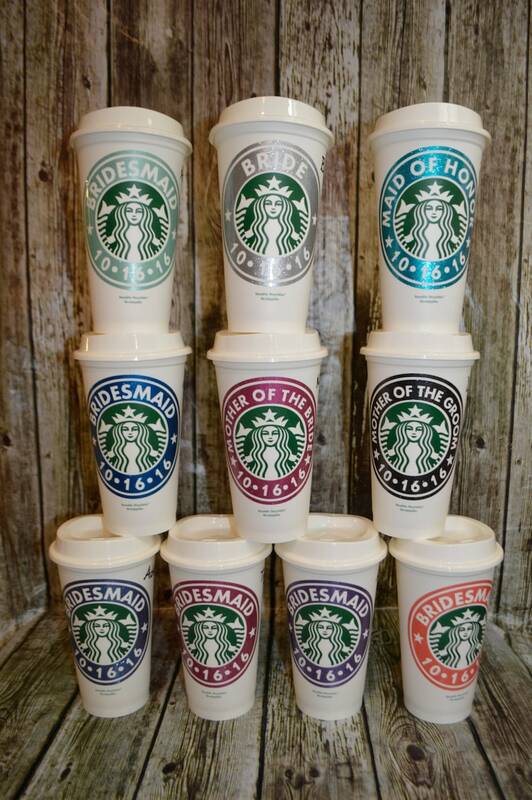 My cups and their presentation offer a high quality gift for everyone in the entire wedding party. All Bling Glitter colors are now included in the price! I'm always adding new colors so message me if you need a color that is not pictured. Please feel free to browse through the hundreds of positive wedding reviews with many photos from my happy Brides: https://www.etsy.com/shop/CleverHollyDesigns/reviews you can find me on Instagram, Pinterest and Facebook as well. I have been crafting these gifts for years and my product (and packaging!) is of the highest quality. This means that I'm very experienced at producing this kind of work and offering the CUSTOMER SERVICE that a Bride deserves. It is very important to me that my products and their presentation are of the highest quality. B) Request a *custom order and I will work with you until your order is perfect. *Custom order: From a computer or pad use the "Custom Order" button (just below the product image) and incluse the details listed below. From the Etsy phone app click the "Ask a Question" Button (just below the product image). My normal production time is up to 4 weeks so please plan ahead and convo me with any questions or special requests like a shorter need by date. I do get many custom order requests so I ask for your patience in advance. I answer all questions in the order that they come in and will answer you as quickly as possible. I'm always happy to work with my Brides and customers. 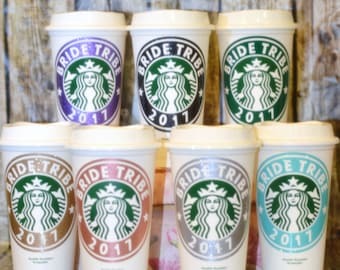 There is a small up-charge for any of these options: Lid Monograms or requesting more than 2 color choices for the ring around the logo. 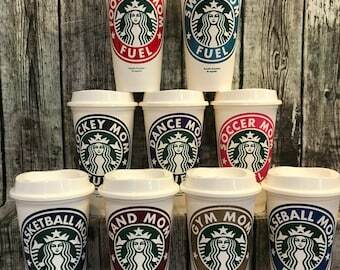 Colors: Choose from the many colors listed... the colors shown are the bling glitter pink and bling glitter gold (the forest green color choice matches the Starbucks green color). In many cases I can special order the vinyl colors to match a wedding theme. Shipping is automatically discounted on 2 or more items. For larger orders or local shipping I can offer a revised shipping total. Hand washing recommended for long lasting enjoyment. The cups say BPA free and top shelf dishwasher safe. I tested a few TOP SHELF washings and the vinyl decal held up fine. 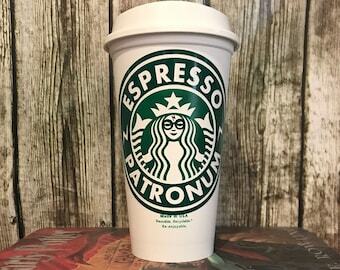 Thank you for the cup! It is terrific!! 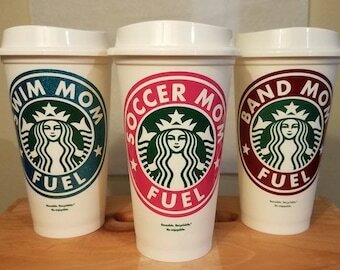 These cups look exactly as advertised! Great quality and super cute! 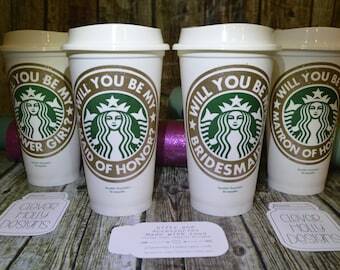 These cups were perfect to ask my bridesmaids with! Thank you so much! I (and they) loved them!! !